When you plant something in the ground, feed and water it and tend to it over the seasons, you develop a relationship with that plant/flower/tree. Then, when you bring a piece of it inside, just glancing at it can transport you back to early spring mornings with a cup of tea and dew on your feet, or late, warm summer evenings, watering the garden, drinking wine or maybe just where you were when you first had the idea of the plant in that space. When you are a gardener, you have a relationship with your plants, and mostly its positive. I have several new readers this year that are not familiar with some earlier works. This is the perfect day to show the truth of so many traditions that take place this time of year. Instead of reblogging all of them, I will give a link to them in this post along with a summary of what they are about. Whatever it is you are celebrating this holiday, please keep in mind yourself. Everything about religion is for you to give your power away. The only truth in this world lies in yourself. So Happy (enter your name here)mas!!!! Yuletide Blessings & Season’s Greetings! We’ve made it through the darkest time, and longest night, of the year. Slowly but surely the sun will begin to wax, and while they still feel far away, the warm days will come again. We’re moving into a potent phase of intention setting and manifestation magic from the 25th to the 6th (the original 12 days of Yuletide or Christmas), when our thoughts and hopes will look to a fresh start at the new year. According to the ancient Celtic and Druidic calendars, the month of Birch begins today. The birch tree symbolizes new beginnings, rebirth, and resurrection. In the runic language of the old Norse, it symbolizes fertility, healing, prosperity, and the feminine mysteries. 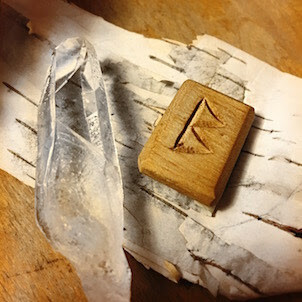 Using your saliva (or a sacred oil) and your index finger, draw the runic Berkana symbol (meaning “birch”, pictured above) on your window. Hold a piece of quartz and whisper your desires for healing, renewal, fertility or prosperity into the quartz. 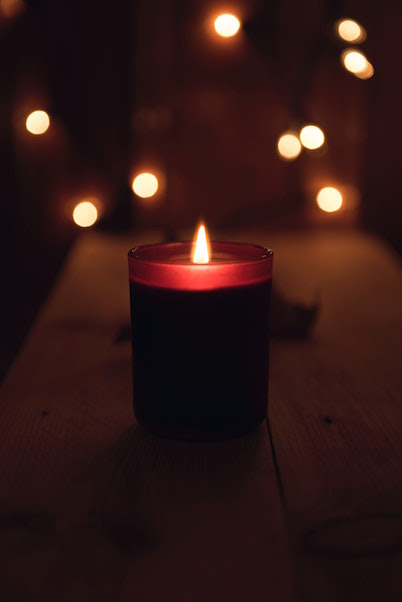 Leave the quartz beside your candle throughout the night, symbolizing the light of your dreams blazing through the darkness. Keep the quartz with you, place it on your altar, or bury it in your garden after the Spring thaw. May magic, healing, love and hope bless you and yours this holiday season! Make this Yule Log use as a handcrafted herbal gift for family and friends this holiday season. The Yule log is traditionally burned on New Year’s Eve to usher in good fortune for the coming year. It is created in the spirit of prayer or ritual for the fulfilment of dreams, hopes, and wishes for prosperity, happiness, peace, or whatever you want the New Year to bring. As you create the log, perform each action with intention for your dreams to come true. 1. Start by tying a red ribbon around the middle of a large piece of firewood. There are many items that can be used to decorate the log such as moss, rosemary sprigs, cinnamon sticks, whole nutmeg, rose hips, frankincense resin, fir branches, pinecones, or prayers written down, rolled up, and tied with pieces of string. H. niger “Angustifolius”-small flowering, pure white form. H.n. “Praecox”-blooms September-February. H.n. “Major,” H.n. “Multiflorus”-smaller flowers. DESCRIPTION: This plant, which grows to a height of 12 to 8 inches, has interesting evergreen leaves that are slightly toothed and divided into seven to nine leaflets. The large white flowers are 2 inches or more across, with bright yellow stamens in the center. The blossoms turn pink or purplish as they age. 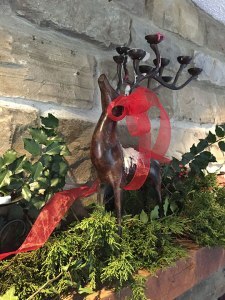 Winter Solstice – also known as Yule – is one of my favourite times of the year…. okay, my absolute favourite time of year. But maybe I say that for all holidays! And while I love the major celebrations of Samhain (the start of the Dark Half of the year in the Celtic Wheel of the Year) and Beltaine (the beginning of the Light Half of the year), there is something about Winter Solstice that touches so many. Virtually all cultures and faiths celebrate Father Sun and the return of the light at Solstice. So what is Solstice? The word solstice comes to us from two Latin words, sol (the Sun) and sistere (to stand), referring to the standing sun that we experience twice a year. During the days around the solstice, the Sun appears to stop in its travels (particularly dramatic in polar regions! ).